A smart lock is first, and foremost, a lock. This might sound redundant, but bear with me. The primary function of a lock is to bar or permit entry once the lock has been engaged. This is one of the ways locks help to stop burglars and intruders. Smart locks perform this traditional function, but they do so in a very different way, and with a very different set of tools. These locks perform the locking and unlocking motions once they have received the proper set of instructions from an authorized device, which makes use of a wireless protocol and cryptographic key, ensuring that the authorization process is carried out smoothly. Wireless communication protocols are essentially digital descriptions and rules that govern and are required, for the transmission of data between devices. Smart locks are mostly operated through smart phones, smart home hubs etc. and as such it is necessary for these devices to be capable of receiving and transmitting data. These protocols are meant to ensure that the data transmissions between devices are kept secure. Wireless communication protocols are intended to oversee and cover areas of error detection and its correction, signal authentication, and the signaling between devices. Cryptographic keys are used in conjunction with these communication protocols in order to ensure that the data transmission between devices remains private. When they are used with the wireless protocols described above, they effectively keep data transmissions secure. This is imperative to making sure that smart locks function the way they were intended. A smart lock uses these basic functions in varying ways to communicate with primary devices, which are most often smartphones or key fobs. These locks are built to receive signals from primary devices that engage or disengage the locking mechanism. Once the data is received from the primary device, the transmission is deciphered. Then the action that the transmission dictates is carried out. In this situation, that would involve activating the door lock. The action of being able to receive and transmit data is what allows these locks to also communicate with other devices aside from their primary one. Many smart locks have the ability to be controlled in an IoT environment, which makes them a much more convenient option for homeowners that are looking to build smart homes. What Goes Into A Smart Lock? In its most basic form, a smart lock consists of two main parts, and it can continuously be broken down from there. The two main parts of a smart lock are the hardware and the software. The hardware and the software have to work in tandem to ensure that the smart lock is functioning properly. If any one of these is compromised, then the lock is also compromised, so it is crucial for smart locks to have more than just well laid out software. The lock itself has to be able to withstand physical attacks to a certain degree. Once you begin to break down the hardware and the software, you can identify the parts of each of these that make up the lock and the key. There is the physical aspect of the lock and the key that falls under hardware. This deals with the deadbolt that might be in place with the smart lock, the keyway, and also the traditional key (if applicable). 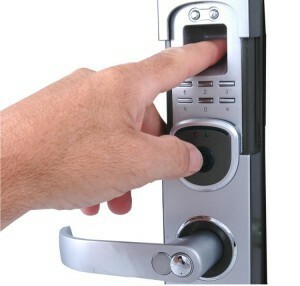 Most of the smart lock models that are available on the market make use of deadbolt locking mechanisms. A deadbolt is essentially a bolt that is engaged by turning a knob, a key, or in this case, transmitting data to the lock. It is always advised for people to make use of deadbolt locks within their homes or offices. These type of locks provide the maximum amount of security that is needed to keep you safe. The American National Standards Institute (ANSI) has grouped deadbolts into 3 grades in order of strength and resistance to damage. Grade 3 deadbolts are the least resistant and Grade 1 deadbolts are the most resistant. There are smart lock models that make use of Grade 1 deadbolts in order to provide maximum security, while some use either Grade 2 or Grade 3 bolts. The hardware of a smart lock is just as important as the software aspect of it. When it comes to the software of smart locks, it is imperative to realize all the parts that come together to make it function properly. The hardware of the smart lock is all housed in one central location, with exception to the key, if there is one available. However, the software has to be used, in most cases, with a Wi-Fi network, a smartphone, or a smart hub. The software aspect of a smart lock is never a stand-alone thing. It has to constantly work with other features to ensure that it is functioning at its fullest. The combination of the software and hardware to form a cohesive unit is what truly separates smart locks from a mere electronic lock. Electronic locks, in their most basic form, operate on an open or closed circuit concept. Electronic locks cannot be integrated with smart home systems in the same way that smart locks can, nor can they be controlled via a smartphone over a wireless network. There are many who ponder just how to differentiate between a good smart lock and bad smart lock, or is there even such a thing? At the crux of it, people wonder about what kind of options they might have when it comes to getting the smart lock that is right for them. Homeowners have a few good options when it comes to fusing their home with a smart lock. In some cases, it is hard for homeowners to fully abandon traditional lock and key systems. Homeowners like this can add on smart locks that control the deadbolt. This allows for the use both the traditional system and takes advantage of the cool features of a smart lock. A perfect example of this is the August Smart Lock. The August smart lock relies on a pre-existing deadbolt, as the smart lock itself is just a replacement for the thumbturn. A lock like this is best used in conjunction with a traditional keyed system. Another option that homeowners have is to completely do away with the old system that they had in place and use second generation smart locks that attempt to make the locking mechanism keyless. This option is best suited for those homeowners who want to go the smart home route. Smart locks work by combining the features of its software with that of its hardware and electronic components. There are many critics of smart locks who have singled out the electronic component of the smart lock as being its weakest point. However, this potential weak access point is beefed up by all the other components that go into making a smart lock. A good number of the encrypted smartphone signals make use of 256-bit encryption codes to send messages. These messages will prompt the smart lock to either lock or unlock. The protocols that are in place to make this happen range from Bluetooth, to Wi-Fi, to Z-wave. Each and every one of these protocols makes it much harder for anyone to hijack the transmission that is being sent to your lock. The lock can be powered by live current or the use of batteries. The lock is generally kept in a low power state until it receives a data transmission. The smart lock will open or lock based on the contents of the data transmission. This is done by activating the pins and tumblers, or at times the slotted rotating discs present in the lock. The circuitry triggers a lock/unlock deadbolt action when it senses receives the proper signal/passcode. This can be sent from either a keypad or wirelessly from a smartphone. These smart locks have to work in conjunction with mobile applications that serve as a bridge between the lock and the key. These applications allow users to perform a variety of additional functions with their locks. This ranges from handing out temporary access keys to visitors or even unlocking the door from a remote location. These apps are also used to initially set up your lock and establish your smartphone as the primary device for your lock. In addition to the features listed above, your smart lock application (if applicable) also helps you keep track of the activity of your smart lock. Smart locks can be integrated with home automation systems and monitored home security systems. This will give users the opportunity to have more control over their smart home and use their smart lock for a host of other actions, such as activating the lights and thermostat. Smart locks generally allow for users to access the lock remotely. This feature helps users maintain the security of their property even when they are not close by. Thanks to the temporary keys feature, smart locks give homeowners more key control. This means that the lock is no longer compromised because several people have the key to it. Temporary digital keys grant access to your home for a specific period of time (set by homeowner) and expires once the time is up. The use of smart locks reduces the chances of homeowners losing their keys, since most of the systems do not use traditional keys to operate. Smart locks are able to help homeowners keep track of who is going in and out of their home by gathering data and logging every time the door is triggered to lock or unlock. Power failure is one of the leading disadvantages of smart door locks. Many of the smart lock models either operate on battery power or on a live current. If the power supply for the lock is interrupted, then the lock will be potentially vulnerable or the convenient features will be useless. There are several different wireless protocols that can be used in manufacturing a smart lock. Due to this, homeowners are put at a disadvantage if their smart lock is not compatible with their smartphone or home automation system. They will have to incur some extra cost in order to have access to the full capabilities of the smart lock. Due to power issues (in both the lock and the user’s smartphone) it is challenging to go completely keyless, which is something smart lock manufacturers aim to do. Some of these locks communicate with smartphones via Bluetooth and Wi-Fi. This is known to drastically deplete the phone’s battery life, leaving the user keyless. Bluetooth Low Energy (BLE) seems to be the only wireless protocol that is even addressing this problem, and it’s a good start. There is no doubt that smart locks are here to stay. Their innovative designs and the cutting edge features are constantly pushing the boundaries of convenience and efficiency. These two things will be the pillars of the technology in the future. However, when it comes to products such as door locks, there is an added layer of security that needs to be addressed. The smart lock industry is very likely looking at the ways it can improve the security aspect of these locks without sacrificing any of its efficiency and convenience. In order to make the best use of smart locks, it helps to know just what they are and what goes into them in order for them to function. Hopefully this article was able to give readers and homeowners some insight into the inner workings of smart locks. « What Is The Role Of A Safe Locksmith Kitchener?